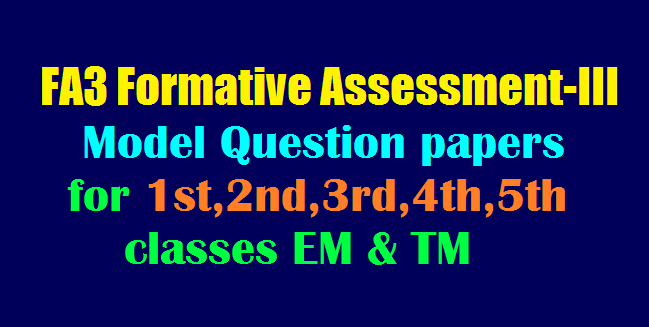 Download Subject wise and Class wise Formative-III Model Question Papers, Formative Assessment - III (2017-18) Model papers FA (formative assessment )3 Question papers for 1st,2nd,3rd,4th,5th classes EM & TM Formative-III Model Question Papers, Formative Assessment - III Mode papers,Formative 3 CCE Question Papers for 1st Class Telugu question paper, AP FA3 question Papers 2nd Class English, Mathematics, Science/ EVS and Social subjects Download. TS 3rd Class FA 3, 4th Class and 5th Class FA 3 Model question Papers 2017. Primary Classes Formative Assessment III CCE Model Question Papers Download. AP Formative Assessment II and TS Primary Classes FA 3. 1st to 5th Classes All Subjects FA 3 Primary Schools Telugu, English, Maths, EVS ( Science ) Subjects Question Papers. Formative-III Model Question Papers, Formative Assessment - III Mode papers,Download Subject wise and Class wise Formative-III Model Question Papers, Formative Assessment - III (2017-18) Model papers from here. CCE FA-3 Formative Assessment III Model Papers Download Continuous Comprehensive Evaluation CCE FA Model Papers Download Primary Schools CCE Model Papers for F-3. Third Unit Formative-III Model Question Papers, CCE Formative Assessment III Model Question Papers Model Question Papers.